I’m one of those annoying people at the grocery store that pauses in the aisle to read the ingredients lists and nutritional facts of everything (I do get out of other people’s way though). When I was shopping for some St. Patrick’s Day recipes, I discovered something sad but unsurprising: all chocolate syrups were basically high fructose corn syrup, sugar and preservatives with a bit of chocolate thrown in. I knew that even if I bought a bottle and used a tablespoon in one recipe, I wouldn’t really want to eat the rest and it would go to waste. There had to be an alternative, I thought. So I left the store empty-handed. When I got home I Googled “homemade chocolate syrup” and discovered that not only could you make chocolate syrup, it’s incredibly easy and fast too. It’s also much richer and has a more intense chocolate taste than Hershey’s syrup. Next time you want to make an incredible sundae or chocolate milk, try out some homemade chocolate syrup! I’ve got a surprise recipe coming up tomorrow using chocolate syrup (another surprsing “I can make that from scratch?” recipe). What else should I use my homemade chocolate syrup for? P.S. Looking for more recipes like this? 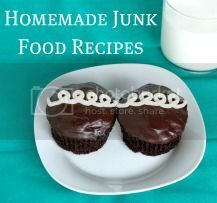 Check out my recipe index of “homemade junk food” recipes for all-natural versions of your favorite store-bought junk foods. I’m one of those annoying people too 😀 This looks very similar to the recipe I use as well! It is amazing stuff. Now the stuff from the store doesn’t taste good to me. Like slightly chocolate flavored sugar. Yuck. I sometimes use my homemade syrup to make milkshakes. Put one frozen banana in your blender(chopped up if need be) put enough milk to get it to blend smooth a splash of vanilla and a couple spoons of chocolate sauce and blend away. Or even a tiny little drizzle on homemade crepes with fresh strawberries. So good! aWESOME…I have always wanted to make chocolate syrup…thanks for sharing..oh the ideas!! Heidi – your smoothie sounds delicious! I agree with you about the storebought – like most things, it just doesn’t live up to homemade! That is so cool. I wouldn’t never think of doing that. What a great recipe – simple indeed :-). And so timely, now that it’s getting warmer, and we are about to start eating ice cream again after the winter. i never thought of making chocolate syrup, but your recipe is very easy. I make chocolate syrup brownies. I’ll have to try the making the syrup for the brownies. Fabulous post!!! This has got to be tons better than the grocery store sauce! Never knew making chocolate syrup was such a simple task. I’m with you on reading the labels, that’s why it takes me so long in the store. It’s also tempting to ask fellow shoppers if they’ve read any labels lately. It’s so funny that I thought the exact same thing the other day — since I started cooking I have found that I want to make everything from scratch and this is just another one to add to my list! Gosh, you could use that syrup in just about anything — I bet it would be great drizzled on cupcakes or brownies for an extra hit of sweetness! Thanks for sharing! I never knew making chocolate syrup was so simple! Looks great drizzled on that ice cream. Yum!! I made my own chocolate syrup for the first time last summer. I will never buy the store stuff again. Not only is it cheaper (and free of all the chemical nasties) but we find it tastes so much better to boot. I think you may have just bent my mind. You mean I don’t have to buy this stuff at the market? And it doesn’t have to have corn syrup? Trying this ASAP. Thank you! I’m so excited about this! I just made vanilla-bean ice cream and I think this syrup has a place right on top. Ooo, what a great idea! And I bet you could flavor it, make like a caramel chocolate syrup or a mint one….thanks for the recipe! I am so doing this very soon. I too stand in the aisles, reading ingredients. I have to, with three kids and having diabetes myself. I want to allow my kids some chocolate milk sometimes, but not with all that junk in it! Seems to be delicious..!!! Can’t wait to have it….!!! Oh my god….this is a wonderful find. I am so obsessed with chocolate and chocolate milk! What a great idea! I have been looking all around for new ideas for my cocoa powder, and this will be perfect! Thanks for sharing. I never buy chocolate syrup coz I don’t like it much. This looks much better than the store bought kinds. Definitely going to try this soon. Your chocolate syrup looks amazing! I actually just made some myself last week for some chocolate malt milkshakes! Mmmm! I also always stop to read the ingredients of everything I buy, I get so disappointed when I see high fructose corn syrup. How long would it last in the fride? It would be great if it lasted a long time so a big batch could be made and used over a few months! Christina – it should last 2-4 weeks in the fridge. I love that you used the organic cocoa, I love making swaps for organic ingredients when ever I can. Who knows about the stuff in the can! This looks delicious! I’ve recently become obsessed with trying to make my own version of my favorite processed foods, so thank you for posting this recipe! How long will it keep for? She said 2-4 weeks in fridge! @alglass – thanks! It’s great to know that it works with honey too. I’ll try that next time! How long does the syrup keep? Thank you! @Rachel – it should last 2-4 weeks in the fridge. Wow! This is AWESOME! I read the labels too…I avoid HFCS as much as possible and try to buy organic and processed items with the least number of ingredients in them. Try it on snowcones! A touch of cream (or condensed milk) on top is a favorite New Orleans treat! @Marcia – that sounds like a delicious summer dessert! Thanks for sharing. This sounds like it is what I have been looking for, I will be making this tonight, so will let you know how I get on. I am currently trying to figure out how to make my own frozen hot chocolate. I thought it was silly to be using organic milk & organic hot choc powder to then load it with a junky chocolate syrup. I know it doesn’t seem like much but it does make a really good sized glass. The first time I made it i used cup of milk & a cup of ice & made over a pint of the stuff lol. I just chucked it all in the blender and gave it a good whizz until it was frappachino consistency, its definatley the closest I have come to Second Cup’s. I was in Canada a few weeks ago and discovered frozen hot choc there – we don’t have it in the UK 🙁 Starbucks do a chocolate creme but that just tastes like a choc milkshake to me. Chop dark chocolate, totally submerge each piece in cream, the heavier the better. Nuke carefully; chocolate burns fast and it melts at just above room temperature. Depending on ratios used, you’ve now got ganache or chocolate syrup. And the reason you must submerge every side of every piece of the chocolate is that otherwise it can seize, ie form a structure that will never melt again (but will still taste good…! Here’s my chocolate torte recipe: http://spindyeknit.com/2010/03/may-the-fourth-be-with-you/ Enjoy! I just made this chocolate syrup a few minutes ago and I LOVE it! I made chocolate milk with it and then drizzled it over some vanilla bean ice cream. Yum is all I can say- thanks for the recipe! This is an incredible recipe. So easy. I added a 1/4 teaspoon of raspberry extract after it cooled and I’m telling you, over ice cream, on milk or heck, just pour into a teaspoon for a healthy chocolate fix. Delicious. Next time I’m going to try using other flavors to add to the basic vanilla foundation…such as orange extract, or mint, or almond. Warning: If you’re another flavor than just vanilla, be careful not to use more than 1/4 teaspoon of another flavor, or the taste will be too overpowering. I happen to love highest-quality vanilla, such as Madagascar Bourbon Vanilla extract or paste, from Nielsen-Massey or Watkins. And, for the vanilla, I double the amount required in recipe because it makes anything you bake taste even smoother. Yummy. Thanks for this recipe. I did the same thing I read the recipes for chocolate syrup and just saw the same thing HFCS and I left the store empty handed. I want to make a black cherry chocolate smoothie but using the store brands seemed to defeat the purpose. Now I’m going to use this recipe. Thank you. Since I’ve been doing a lot of research on junk foods, I’ve been more alert on what I feed my family. I was looking for a good flavor to add to coffee and this was perfect. Of course I made enough for the hubby and kids because the hubby is dead set on having chocolate milk this week. 🙂 Now I am wondering what other kinds of syrups I can make! I made this tonight, and it is so delicious! It tastes like the chocolate sauce they use at Dairy Queen. Anyways, I was wondering if this needs to be stored in the fridge? @Grace – yes, store in the fridge in an air-tight container. When my sister and her kids moved in with me after she split with her hubby I told her I had only one rule, we eat healthy in this house! Whole grains, brown rice, ect. So when she came out with the Nesquick powder I shuddered in horror! I knew there just had to be a better alternative. I was looking all over and found a lot of other recipes call for WAY more sugar than this one. When I did find this I only made ONE substitution. DARK CHOCOLATE!! It’s not only my favorite but because of its powerfull flavor you don’t need much at all!! The kids go crazy over it and like it better than Nesquick. I just saw the recommendation for different flavor extracts and I’m sooooooo excited to try MINT! Thank you again for this recipe!! Substituted Agave nectar for the sugar and it worked beautifully! My kids are thrilled! Since I know my husband and kids will balk at this, I am going to make it and put in into the empty Hershey’s syrup bottle. They’ll never know… 🙂 Thanks for an awesome and EASY recipe! I have been making my own cocoa syrups for a while now. Absolutely amazing!!!! Try mixing up the flavors with different spices. My fav is cayenne and cinnamon. Then I found this website that actually sells the stuff. It’s called the NakedSweetShop(.com) They are a gourmet vanilla supplier, but they also sell gourmet all natural syrups. I have tried to base my syrup around theirs, I just can’t seem to make it as good as theirs. And their vanilla is to die 4. You get 4 beans for $10 and these are not like those test tube beans. Super oily and so pungent I just wanted to melt right there. And the size of these things, just half a bean is all you need. They just posted a blog about a vanilla bean marshmallow recipe and I am so exited to try it out. So glad I found this recipe. My little one will be so excited to finally have chocolate syrup again and it will be so much better than the store bought he had before we began eating all natural! I’m slapping my head, wondering why I never considered this!! I will definately be trying this homemade sryup soon! Thanks so much! Just discovred your site today… I think I’ll be here a while! Very similiar to my recipe. I love that I can control the sugar! This stuff is incredible! I just made a batch, but used dark chocolate cocoa. It is to die for! Now I’m eager to explore the rest of your blog and try more of your recipes! Thanks for sharing! Do you know how much this recipe makes? I cannot wait to try this recipe! I am also a label reader, and it drives me crazy that high fructose corn syrup is in everything. When I last eyed the chocolate syrup I too wondered how I could make my own without all the garbage in it. You have made my day! Thanks so much for this recipe. My husband must have chocolate syrup in fridge. This will now take its place. Shhhh. @Delo – it’ll be our little secret 🙂 Hope you both enjoy it! This was the first recipe I clicked. I just made a batch and it’s just wonderful. Hot cocoa and toast tonight! I’ll never buy syrup again great recipe! @Kelly – I’m so glad you ran across my post on your first click. Enjoy the syrup! As a person who is allergic to high fructose I am thrilled to have found this recipe. I can’t wait to make it. Do you know about how long you can store it in the fridge? I’m thinking since now I can use it myself it won’t last long…lol! Thank you so much for this. I have been trying to figure out how to make more and more things at home. my husband and I are trying to cut out high fructose syrup as much as possible. This recipe is awesome. Love the taste and makes the house smell so good!!!! Is it tea spoons or table spoons of salt & vanilla extract? @Ashley – t = teaspoons, T = tablespoons, so those are both teaspoons. This is great! How long does it keep? I never had a bottled for more than 10 years (Chocolate milk was always store-bought in cartons or bottles). I found this recipe and the resulting chocolate milk was insanely good (it tasted like “dark chocolate milk”) it put the best carton brand we had to shame. I then tried using store-bought syrup and it tasted weird. From then on, this recipe is my go-to for chocolate milk. Thanks for sharing! I made an adult version of this for St. Patty’s Day. I halved the recipe and instead of adding vanilla I added a shot of Jameson Irish Whiskey. Went perfectly with the Guiness Cake with Bailey’s Frosting. @Elise – that sounds so good! What a great idea. This looks fantastic! i can’t have high fructose corn syrup so this is perfect!! Thank you for this recipe!!!! I’m going to replace the simple syrup in a marshmallow cream recipe with the chocolate. Wish me luck!! Just made it for my daughters (2&3) who are picky about plain milk, made this and they love it, as do I. Great recipe! I also used reg sugar instead on organic (which i never even heard of lol), but still tasted great! Made a batch, but only used 1 cup of sugar and it was plenty sweet. I usually dilute my kid’s chocolate milk anyway. Thanks for sharing, I’ll never buy the bottle again! Would it have to sit in the fridge for that long before you can use it or is 2-4 weeks the shelf life? @Samantha – the 2-4 weeks is the shelf life. You can enjoy it immediately after making it. Oh my gosh, delicious! I am trying a few variations of this recipe today. I just replaced the sugar with brown sugar and it tastes a lot like hot cocoa. Next on my list it to figure out how much malt to mix in for chocolate malt flavor! Hi Stephanie. I just want to let you know that your recipe is now featured in my coffee break post for this week. I hope you’ll like it 🙂 I made this syrup last week, and I can tell you, it was really delicious. Great work! @Danijela – thanks for the feature! @Paula – yes, regular sugar will work fine. I am going to try a sugar free version with Splenda. My three-year-old just discovered chocolate milk, and hot chocolate season is coming up, so for me it is great timing to find your homemade version. We need a sugar-free version, but my husband can taste the Splenda, and cannot eat it. He can tolerate Stevia, so we use that. Do you think I could get by using the liquid Stevia? @Leesers – I’m not sure how using liquid will affect the recipe. I saw some powdered Truvia in the baking aisle at Target yesterday, and that may work in place of sugar. Let us know what you end up trying and how it works out. I’ve been making this for about 2 months now, and my husband swears it is better than store bought. I didn’t quite believe him. I loved it, but BETTER than Nesquik?! Not sure. So we did a taste test, and let me tell you, this stuff is AMAZING! Never mind not having as many ingredients, it actually tasted like CHOCOLATE milk, not just over sugary brown milk, which is what the store bought tasted like! NEVER going back! Yeaaahhhh…. SO, I tried this just now and I ran into a bit of a problem… Not the recipe, that was just as you said it would be. The SAUCE, however, is so delicious it is a HUGE problem restraining myself from drinking it, hot, straight out of the saucepan. Thank you, a million times over, for sharing this so I can feel better eating junk food that is waaaay less junky! That’s a perfect recipe, I made it and I LOVE I!!! Just made this recipe. So easy, & so much better than store bought. I will drizzle it over almond joy cheesecake. This is a keeper! Can you use splendia to make this instead of sugar? Marie, I haven’t tried using Splenda so I’m not quite sure, but I don’t see why it wouldn’t work. Please let us know if you give it a try – I’d love to know how it works. Just made this. Was skeptical that it would get by my 2 and 3 year old without some complaint but it did! Used it in place of their Nesquik this morning! Thanks! Thank you so much for this! I’m so glad I stumbled upon your site (from a Pinterest pin for your homemade marshmallow fluff). I’ve recently started analyzing ingredients in everything too and reluctantly bought Hershey’s chocolate syrup not too long ago. So glad I have a preservative-free alternative now! Delicious on a banana split. Is this recipe ok to can? Helayna, I have to be honest and say I’m not sure. A quick Google search came up with a few chocolate syrup recipes you can can, but at quick glance they all had corn syrup in them. Here is one you could try. Just wanted to say thank-you. I use it in my mochas. Love it!